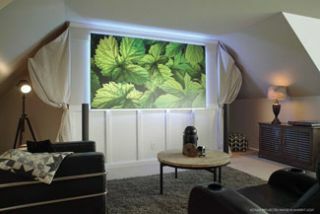 Elite Prime Vision, the dedicated custom install division of Elite Screens Inc., is now shipping its eFinity-PolarStar "edge-free" projection screen, which features a wrap-around material over an internal framework. EPV’s eFinity-PolarStar has just received its ISF certification and now comes in more sizes with enhanced features. The design features a wrap-around Ambient Light Rejecting (ALR) material over an internal framework. Despite the eFinity-PolarStar’s resoundingly positive reception, EPV took measures to improve an already popular product. The first was to get its accurate color fidelity, black level performance, and flat spectral response certified by the world-renowned Imaging Science Foundation. New enhancements feature a redesigned means of connecting the material that is faster and easier to attach. There is now a sturdier 6mm removable-edge bezel included, plus a wrap-around, RF remote-controlled, multi-colored LED kit. The Ambient Light Rejecting characteristics of the PolarStar 5D material reject up to 85% of ambient room light and is polarized for 3D rendition. It is an angular-reflective PVC multi-layer screen material with a reflective brightness level of 1.3 gain and a 70-degree wide-viewing angle. The silver-gray protective surface coating is a reflective compound that filters out indirect light while enhancing contrast levels. In addition to maintaining exceptional picture brightness and clarity in dark or illuminated rooms, the material is polarized for active or passive 3D presentations while maintaining 92 percent polarization levels. The material is compatible with high-definition video modes such as 4K, 1080P, 720P, WXGA, and XGA formats. For all these reasons, the PolarStar-eFinity performs a world-class role in either a bright or low-light environment.